Eleanor O. Schlee was born on March 23, 1910. 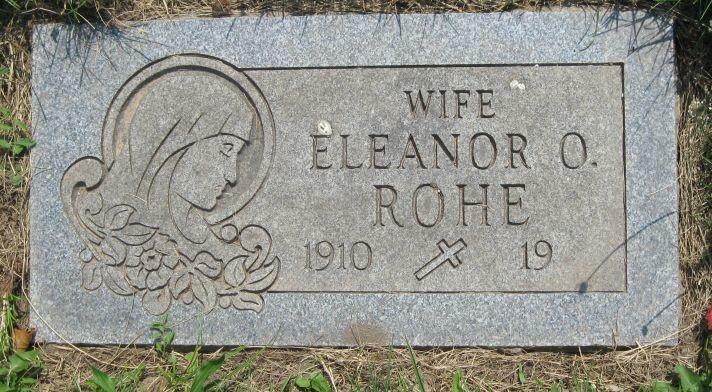 Eleanor was first married to Howard E. Rohe, born in 1904 to Balthasar and Catharine (née ???) Rohe. 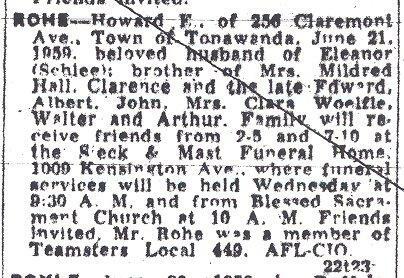 Howard died on June 21, 1959. He is interred in Lot 1754-1/4, Section I, Mount Calvary Cemetery (Pine Hill), Cheektowaga, NY, adjacent to the grave of Eleanor and of Eleanor's sister Frances (née Schlee) Meyers. Eleanor later married Albert Newton Goodnow, who was born on December 12, 1908 in Farmington, NY. Albert served the Niagara Falls Fire Department for 28 years. 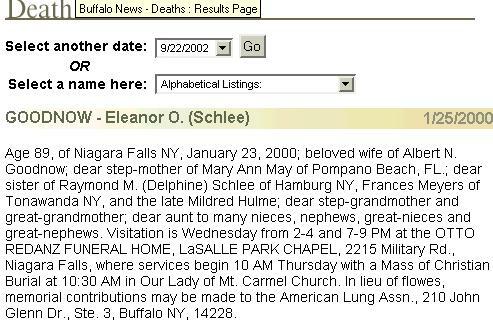 Eleanor died on January 23, 2000, in Niagara Falls, NY. She is interred in Lot 1754-1/4, Section I, Mount Calvary Cemetery (Pine Hill), Cheektowaga, NY, adjacent to the graves of her first husband Howard and of her sister Frances (née Schlee) Meyers. It appears that Eleanor never bore any children. Albert died in Orchard Park, NY, on April 18, 2001. Frank X. Schlee: Born 1883; died 1968. Christina F. (née Jacobi) Schlee: Born 1884; died 1953. 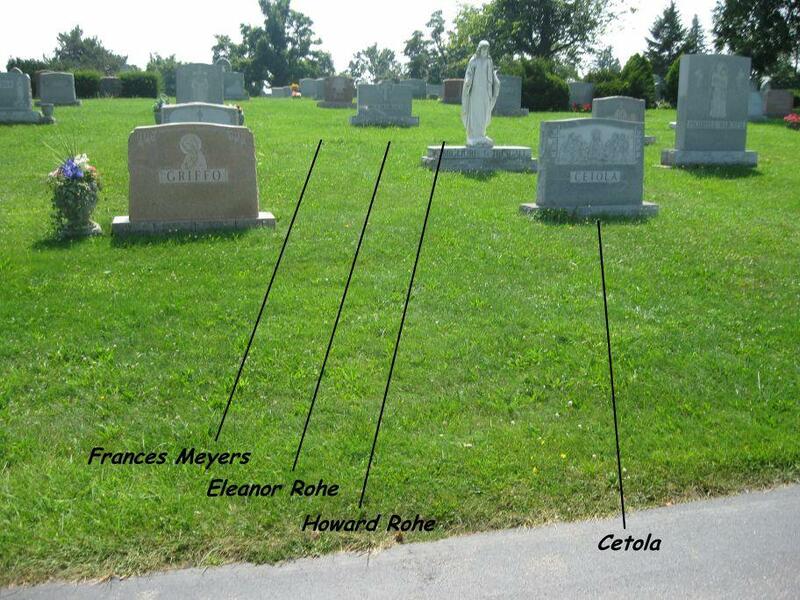 General location of the gravesites of Eleanor O. (née Schlee) (Rohe) Goodnow and Howard E. Rohe, Lot 1754-1/4, Section I, Mount Calvary Cemetery (Pine Hill), Cheektowaga, NY. A map to locate the gravesites is available here. 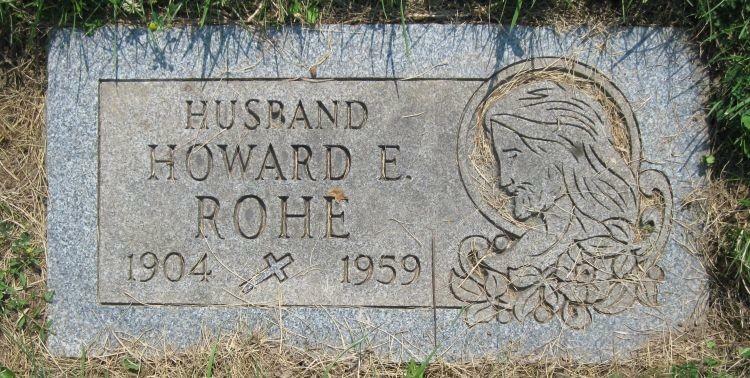 Grave of Howard E. Rohe, Lot 1754-1/4, Section I, Mount Calvary Cemetery (Pine Hill), Cheektowaga, NY. Grave of Eleanor O. (née Schlee) (Rohe) Goodnow, Lot 1754-1/2, Section I, Mount Calvary Cemetery (Pine Hill), Cheektowaga, NY. Obituary: Howard E. Rohe, born 1904, died June 21, 1959. 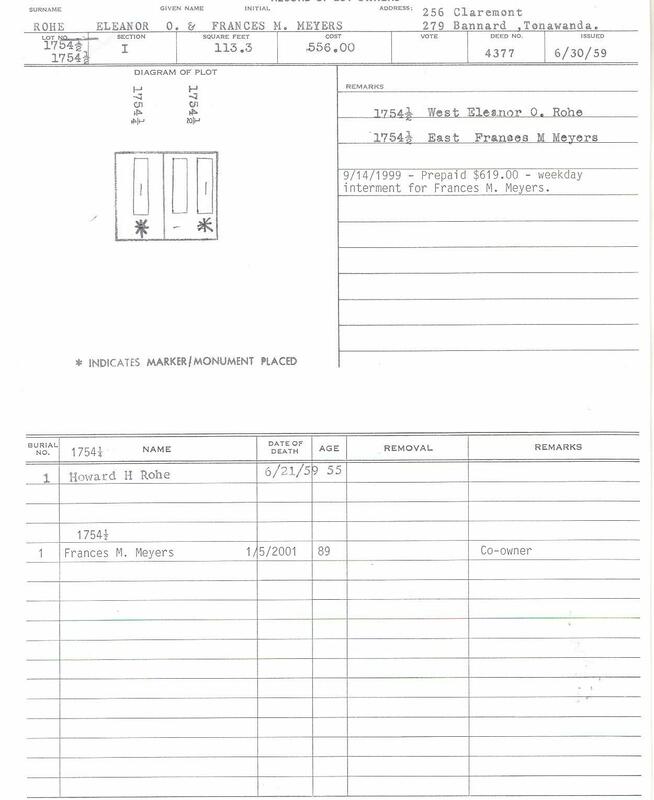 Cemetery Plot Record: Howard E. Rohe. 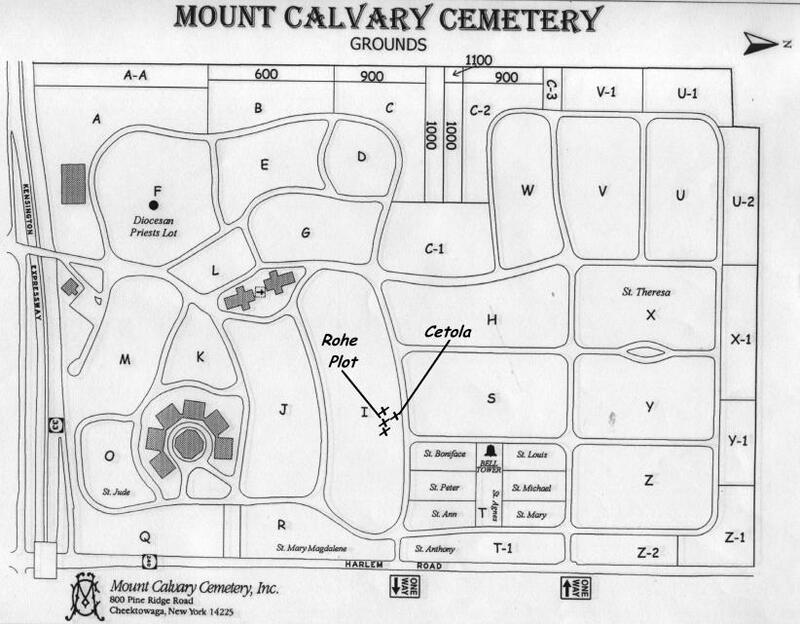 Lot 1754-1/4, Section I, Mount Calvary Cemetery (Pine Hill), Cheektowaga, NY. Obituary: Eleanor O. (née Schlee) Goodnow, died January 23, 2000. Social Security Death Index: Eleanor O. (née Schlee) Goodnow, born March 23, 1910, died January 23, 2000. 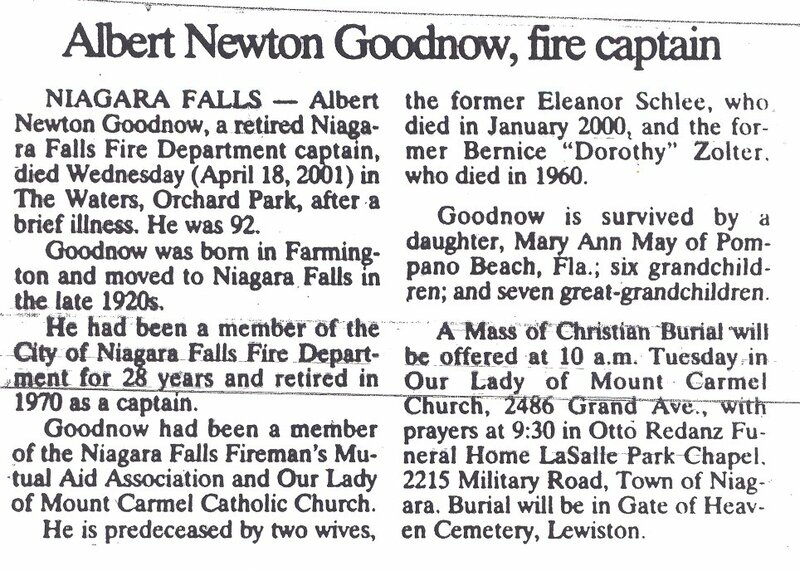 Obituary: Albert Newton Goodnow, died April 18, 2001. 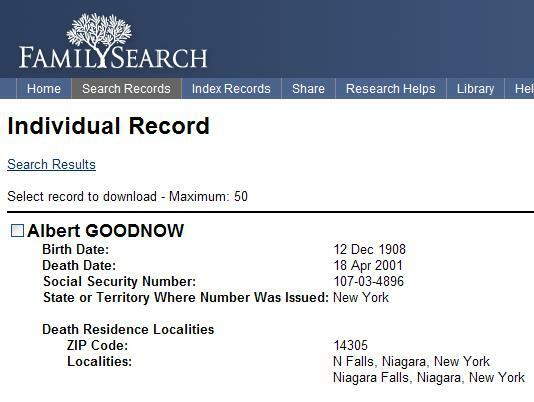 Social Security Death Index: Albert Goodnow, born December 12, 1908, died April 18, 2001.